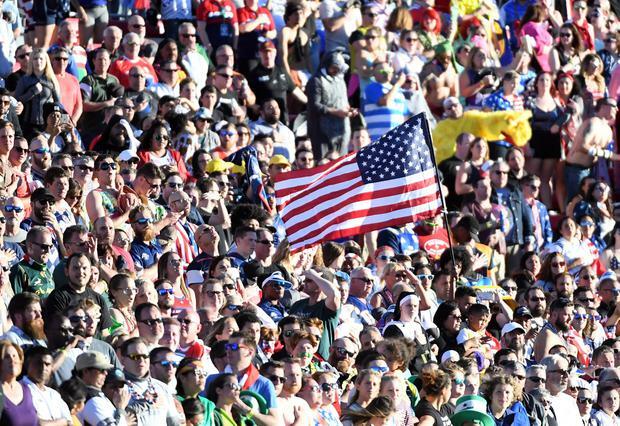 Fans at the HSBC USA Sevens rugby tournament in Las Vegas take dressing up to a whole new level though and are nuttier than a five-pound fruitcake. Credit where credit's due, however, each and every Donald Trump, Captain America, Abraham Lincoln, star-spangled, Spandex-wearing supporter I met loved the game of rugby with a passion I have rarely seen before. It was fitting then that USA won the 2019 Las Vegas invitational, defeating Samoa 27-0 in the final at the Sam Boyd Stadium to send the mostly-American crowd to a whole new level of elation. Not surprisingly Las Vegas is one of the most popular tournaments on the Sevens World Series, a three-day event where rugby fans party through the day - and often well into the night. The annual event includes a men's and women's international competition and this year had 16 countries competing across 45 games and in typical American style, it also has one of the best international fan festivals I have ever seen. My friend and work colleague Christopher Woodhouse jumped at the chance to join me in watching the tournament and enjoy the bright lights of Sin City. We were lucky enough to stay at the Park MGM - the newest resort on the strip which was formerly known as the Monte Carlo. This hotel is amazing, providing a much more upscale experience than many of its neighbours but still maintaining the magic of Vegas by keeping the original chandeliers and ceilings from the days of the Monte Carlo, inspired by the famous Monaco casino. Thanks to the swift DIY computerised check-in, we were in our room within 10 minutes, which proved a real home from home (with more comfy beds and a wonderfully quirky, brick-tiled bathroom) over the next three days. What we needed after a long 10-hour flight wasn't sleep though - we required some great food and drink to keep us going. We headed to Beer Park at Paris to do just that and were treated to some true Vegas hospitality. Located on a 10,000-square-foot deck overlooking the world-famous Las Vegas Strip and opposite the Bellagio fountains, Beer Park features an outdoor grill, picnic tables, and more than 100 draft, can and bottle beer selections, including 36 beers on tap. Grilled selections are Beer Park's specialty, with a unique preparation method that brings the essence of Budweiser into the cuisine through preparing meats and other foods on a custom-made Beechwood Grill. We grabbed some chicken wings, mac and cheese egg rolls and two of the most delicious burgers we have ever tasted and felt like new men. A good eight hours of sleep and we were ready for the great day of rugby ahead - after breakfast of course. We headed to Primrose, situated right off the lobby in the hotel, which has a distinctly French country feel. A couple of mimosas later and after doing our best to finish the biggest and best pancakes we have ever tasted, we were good to go. The 25-minute drive out to the Sam Boyd Stadium was a pleasure thanks to the Presidential Limousine service. They very kindly drove us to all our destinations during our trip and with the quality of the cars and the drivers it is no surprise they are the No 1 limousine service in Vegas. After a great day of rugby it was back to the city for dinner at Rose. Rabbit. Lie at The Cosmopolitan. This can best be described as a modern day supper club with live music, dancers and truly amazing singers performing tableside. The food is reimagined classics served in exciting ways that only Vegas can and our orders of mac and cheese with black truffles, short rib stroganoff with forest mushrooms, semolina sheet and a short rib jus, crispy pork belly with grilled corn relish and roasted chicken with basil pesto, Parisian gnocchi and charred broccoli washed down with two old-fashioned cocktails were all a little taste of heaven. The dessert was the restaurant's spectacular signature chocolate terrarium which contains chocolate pudding, chocolate buttermilk cake, chocolate "soil", puffed wild rice, crispy chocolate tuile and hazelnut ice cream. To be honest, after this feast for the senses we were lucky to be able to lift ourselves out of our seats and head next door to see Opium by Spiegelworld - arguably the hottest show in Vegas right now. I've actually thought long and hard about how to describe this breathtaking and laugh-out-loud performance. The publicity material says: "OPIUM is a fast, funny, and funky love letter to every B-grade science fiction movie ever made." But perhaps the guy on Facebook who said, "It's like Rocky Horror Picture Show met Buck Rogers and exploded in Captain Kirk's pants!" does it better. Either way it is something Christopher or I will NEVER forget. A brief and unsuccessful spell trying to win our fortunes playing roulette at the Park MGM casino failed to dampen out enthusiasm as we headed to the official Rugby Sevens party at the hotel's impressive On The Record speakeasy and club experience. I know it was late when we went to bed but neither of us can remember exactly when. Another great breakfast at Primrose and we were off for the finals day at the stadium. I remember being good at rugby once - it was a Saturday in 1998. But despite my overall lack of ability, I've always loved the game. Unfortunately nowadays my fitness levels are so bad that my wife calls me Spiderman! That's not for any superpowers but rather how difficult I find it getting out of the bath. So to watch the final of an international sevens rugby tournament was something of a dream come true for me. From early on the atmosphere was electric and when USA ran out on to the pitch for the title decider against Samoa, the crowd went mental. We both were hoarse screaming U-S-A and the home side's magnificent performance was just what the team and their fans deserved. When we arrived back at the hotel we had definitely worked up an appetite and my God we were in for a real treat on our last night in Vegas. Los Angeles culinary legend Roy Choi's restaurant in the hotel is his first in Sin City and is a true celebration of LA's Koreatown food, culture and music. The Korean BBQ joint brings diners into Roy's reality with a functioning bodega facade, slushies made with top quality spirits, freshly-pressed juices and the flexibility to go from tacos and hot pots to caviar and truffles in one meal. If you ever do get the chance to go, don't look past the thin sliced pork belly and shoulder with kochujang and sesame or the uni dynamite rice - both are quite simply sublime. One of the truly wonderful things about visiting Vegas during the USA Sevens is that you get to meet so many fans. So when we retired to the hotel bar after dinner for a nightcap we ended up staying three hours chatting and drinking with supporters from across the world. Neither Christopher nor I felt too fresh the next day so we were particularly grateful we had been invited for lunch at Beerhaus at The Park for our last meal in the city - a fresh take on the classic beer hall, where an artfully curated menu ensures both beer nerds and casual drinkers will find their favourites. The kitchen rounds out the experience with savoury sausages, sandwiches and snacks all made with hormone-free meat and locally-sourced produce. The Beerhaus Brat with ipa cheddarwurst, smoked bacon and onion jam, fried green beans served with lemon aioli and the BBQ rib dinner with a halfrack ribs, fries, slaw, and Texas toast were just what we needed to perk us up and prepare us for the long journey home. I used to think that watching Ireland play at the Aviva was the best place to watch rugby - after these three days in Vegas, it's definitely time for a rethink. By Martin Breen Over the past five years I have only been in London for work purposes, so I felt it was time to hit the tourist trail there.